Indoor bikes have been around for nearly 100 years. 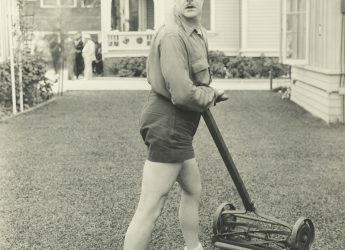 In fact, the “Exercycle” was a state-of-the-art piece of equipment in the mid 1900s, even though comparing it to today’s spin bikes is like comparing a smart phone to two tin cans connected by a piece of string. The top 8 best spin bikes? The exercycle wouldn’t make a modern top 7000 of any type of indoor bicycle. Keep reading just below to find out which spin bikes make it onto Groom+Styles’s top 8 list. Today, indoor bikes and spinning classes dominate gyms and fitness centers. The allure of a quick workout in the comfort of your home on a stationary bike, though, is just as great now as it was back then. However, now we have more advanced equipment to do it with, making it simpler than ever to get in a terrific cardio workout without having to waste an hour or more getting to and from the gym. 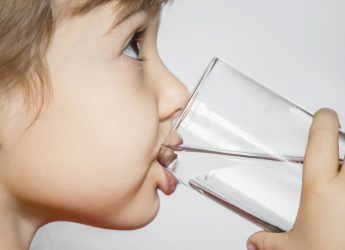 One important note: when you go to the drugstore, you don’t say “I need some facial tissue.” You say “I want to buy some Kleenex,” even if you plan on buying the cheapest tissue in the store. That’s because the brand name “Kleenex” has become synonymous with facial tissue. It’s the same thing with spin bikes. Most people now use that term, or simply the word “spinning,” to refer to indoor bikes and biking. 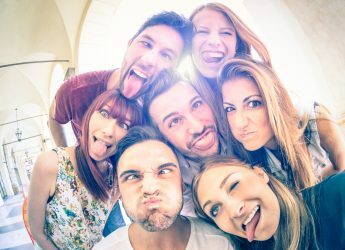 However, those are actually copyrighted terms owned by the company, Mad Dogg Athletics, whose Spinning bikes have made indoor cycling so popular that everyone simply uses their name instead of the more generic phrase “indoor bike.” We’ll try to use the term “Spin” for that company’s products wherever possible. Here is the best spin bike (indoor) list as reviewed by Groom+Style – let’s go for a spin. Keiser M3 Plus Indoor Cycle. Click the photo to see the Price on Amazon. Mad Dogg may own the brand name in spin bikes, but the Keiser M3i Plus is the Rolls-Royce of indoor cycling. It’s sturdy, it’s high-end gym quality, it has a beautifully minimalist look – and it gives you a workout, unlike any spin bike you’ve ever tried. 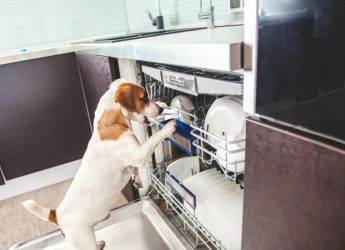 The real key to this machine’s excellence is its groundbreaking Eddy Current magnetic resistance system, which the company spent ten years developing. Without getting into boring detail, the design gives you 24 full gears of eerily-quiet, realistic biking ranging from easygoing to grueling, in the comfort of your bedroom or basement. And the bike almost never needs maintenance, because the moving parts in the drive system never touch each other; when you change gears, the flywheel simply moves closer to (or further from) the magnetic field. The flywheel is also positioned at the back of the bike which ensures that sweat does not fall in causing damage. The beautifully finished Keiser M3 Plus Indoor Cycle – fully adjustable with its exceptionally designed rear flywheel. The Keiser M3i Plus is exceptional for any type of indoor work but is at its best during a full-blown workout, as the ability to cycle with maximum resistance is great for cardio health and optimal for fat burning and muscle strength. The 24 gears also let you gradually increase or decrease the intensity of your session, and make cool-down a breeze. There are also more fully adjustable features on the M3i Plus, including the seat, fore and aft handlebars and Shimano Combo pedals than any other indoor spin bike. The onboard LCD display shows most of the data you’d expect; the only thing it’s missing is the type of pre-programmed options you find on upright stationary bikes (and the Diamondback Fitness 510Ic, which we’ll get to shortly). The Keiser handlebar design is arguably simplistic but does have all the positions you will need. The computer shows RPM, Power, Heart Rate, Time, Resistance/Gear and Distance. The Keiser spin bikes do have one of the lightest flywheels on the market at about 8 lbs. There are some people who suggest that having a lighter flywheel can be a disadvantage. Groom+Style discuss the reason why we believe this is not an issue when it comes to the Keiser range of bikes, in the following article – Spin Bike Flywheel Weight – Is a Heavier Flywheel Better On an Exercise Bike? If however, you are still interested in a bike with a heavier flywheel then you should consider an alternative like the Diamondback fitness (32 lbs flywheel), the Spinner NXT (41 lbs flywheel) or the Schwinn AC Performance Plus (37 lbs flywheel). 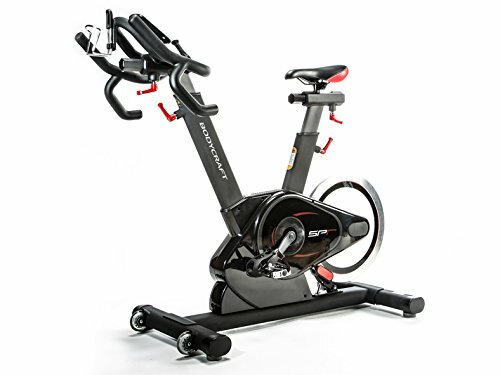 If you’re on a budget, then this is not the bike for you because it is one of the most expensive spin bikes on the market. However, if you have the coin, it is a brilliant indoor spin bike for home use. an improved console so you can pair the “bike” with your mobile device (and a free app) via Bluetooth to record your workout. preset holes in the seat adjustment which are there as a safety measure. You can tighten the seat in-between the preset holes and if the seat does happen to slip it will then catch on the next preset. M3 Plus/M3i Adjustability: seat and handlebars can be adjusted vertically and horizontally. Note: on the original Keiser M3 the handlebars do not have a horizontal adjustment. On the M3 the stem is angled forward so moving the adjustment up also moves the handlebars forward (conversely moving the handlebar stem down moves the handlebar backward ). At both extremes (lowest position and longest position) this can potentially create some fitting difficulties for smaller people or larger people. 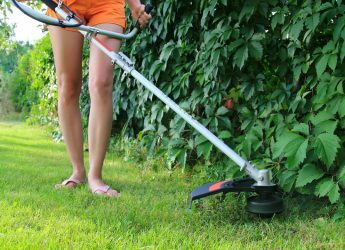 You can also investigate Keiser’s latest model the Keiser M3iX which comes equipped with X-bars. X-bars are effectively handlebars that move from side to side (7 levels of resistance). The independent lower body and upper body movement offer an additional core and upper body workout. The Groom+Style team did enjoy the feel of the X-bars, and if you can afford it, think the added variety you get from the X-bars is well worth it. Schwinn AC Performance Plus. Click photo to check the Price on Amazon. In the same price range as the Keiser, this Schwinn has a substantially heavier, perimeter-weighted flywheel (37 pounds vs. the 8-pound flywheel on the Keiser). As we’ve mentioned, the Groom+Style team prefers a lighter flywheel because it provides a more comfortable ride without being overly-aggressive or putting too much strain on the knees. Many serious cyclists disagree, however, preferring the high resistance of a heavy flywheel – and for those folks, the Schwinn Fitness AC Performance Plus is a perfect choice. The flywheel may be heavy but the bike is lighter than you’d expect because the frame is made from aluminum rather than steel, making it rustproof as well. Solidly built and virtually maintenance free, the Schwinn has a large following of dedicated fans among serious cyclists. A terrific six-magnet braking system distributes this spin bike’s braking power, and a new Carbon Blue belt drive with soft nylon teeth (which has superseded the old Schwinn chain drive, although chain drive models are still available) makes the ride smoother and quieter than we expected. The belt is virtually maintenance-free and should last for years, due to its polyurethane construction and carbon fiber core. ErgoLoop performance handlebars, aero bars, and double-link pedals (compatible with Shimano SPD clips) add to the great performance of this high-end Schwinn spin bike, and it is built exceptionally well (not surprising, considering the company’s heritage). The Schwinn ErgoLoop performance handlebars with the Echelon console attached (console shows Power, RPM, Speed, Calories, Gear/resistance, and various stage measurements). The only downside is that the AC Performance Plus doesn’t come with an onboard monitor/computer; you’ll have to spend another two hundred dollars for the MPower Echelon console (or even more for the Echelon 2 with power upgrade). Groom+Style prefers spin bikes with lighter flywheels, but if you’re on the other side of that argument this Schwinn AC bike is about as good as it gets. 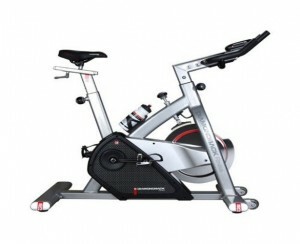 Diamondback Fitness 510Ic Indoor Cycle. Click the photo to check the Price on Amazon. 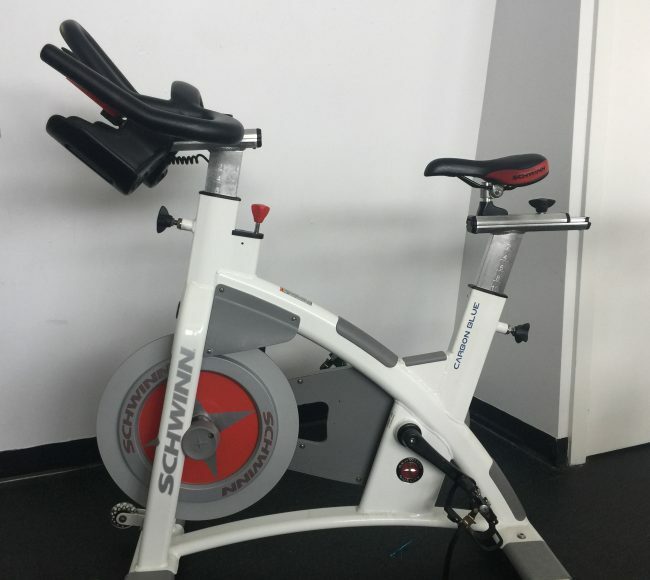 With almost all of the features of the Keiser except for its very smooth belt drive system, the Diamondback Fitness 510Ic is a terrific spin bike for less than half the price. This is a heavy indoor cycle with durability to match; the belt-driven/flywheel system works extremely well to give you the different varieties of workouts most people want from a spinner since you can select between 16 levels of computer-controlled resistance. The ride is even quieter than you’d normally expect with a chain drive, and there are full fore/aft handlebar and seat adjustments possible for riding comfort. One of the standout features of the 510Ic is the computerized integration between its operation and the monitor mounted on the bike. 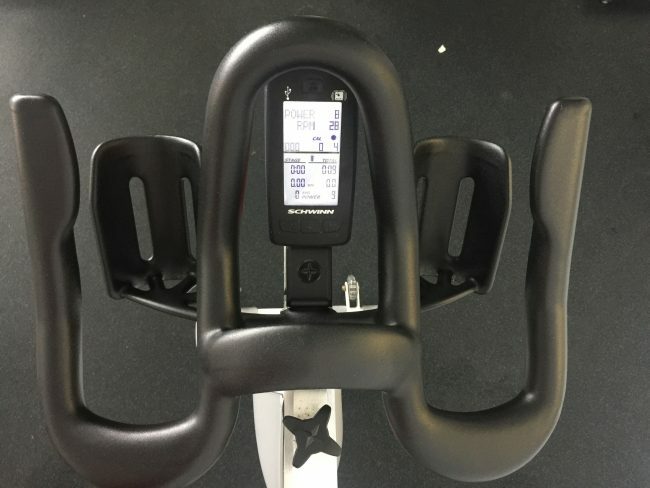 It gives you a ton of real-time information about your ride and fitness (including four heart rate functions) and also has 14 different automated workouts programmed into the system, much like you’d find on an upright model but unusual on spinners. On top of Groom+Style’s recommendation, Consumer Reports has given the Diamondback Fitness 510IC a “Best Buy” designation, and it’s easy to see why. It may not be quite the bike that the Keiser is but for the price, but it might be exactly what you are after. 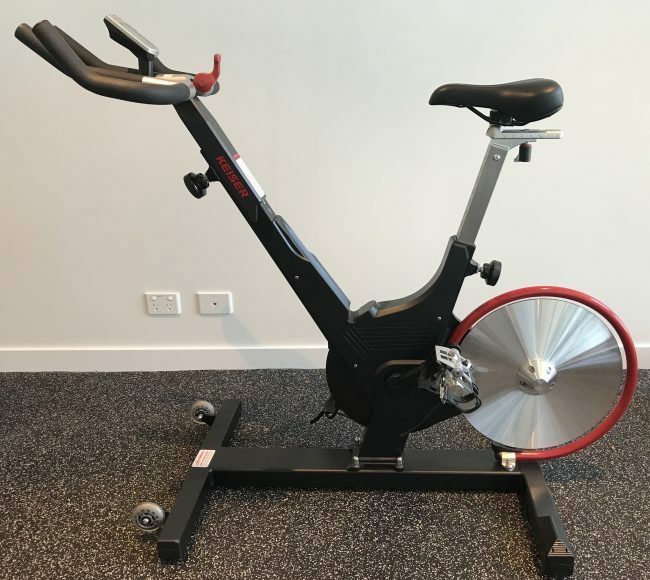 The build and design of this Life Fitness spin bike is excellent, with the rear-mounted flywheel powered by magnetic resistance (20 selectable levels controlled by a lever located below the handlebars) and multi-ribbed belt drive. That makes the ride very smooth and extremely quiet, and the machine virtually maintenance-free. The rubberized handlebar grip is relatively comfortable whether you want to ride with your hands at the ends, in the middle or in between. The fully-adjustable seat has a cutout to allow for extra air flow, and the dual-sided pedals accommodate SPD clips. The GX Group Exercise Bike is a bit on the heavy side but it’s easy enough to move around, thanks to a pair of transport wheels on the front. And with a rust-proof welded steel frame, this baby should be around for a long, long time. The only things missing from the GX are accessories. The LCD console is fine and it will display all of the metrics you’d want to see (except watts), but there’s no full-featured computer or touch-screen monitor, no pre-set programs, no connectivity options, not even a device holder (unless your device will fit into one of the water bottle holders). If you want those goodies, plus a 155mm Q-factor (it’s 170mm on the base GX), the Life Fitness IC6 with MyRide console is worth a long look – link to Amazon below. The Lifecycle GS doesn’t provide a ride that fully simulates that of a road bike – but that’s not what it’s built to do. It’s a great spinning bike that’s perfect for serious athletes, delivering a terrific workout with full control and a smooth, noise-free ride. Sunny Health makes a lot of good-quality budget fitness products (see the G+S review of the Sunny SF-B1001 a few notches below this review, for example). 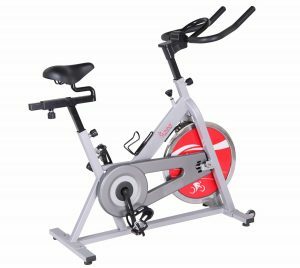 The review team wouldn’t exactly categorize the SF-B1805 as a “budget” spin bike, since its price is a bit closer to the models at the top of this list than the bottom. What we will say, though, is that it’s a very good value choice. This is a magnetic-resistance, belt-driven bike with a strong steel frame and a heavy-duty, 44 pound flywheel that delivers a smooth and quiet ride. Resistance can be gradually increased or decreased while you’re riding, with the knob that’s built onto the frame. The one drawback with the knob, however, is that you can’t actually assign a number to how much resistance you’re experiencing. The seat and handlebars can be adjusted through four different positions, and there are steel toe-cage pedals with adjustable straps. You have to give up something when you’re paying a lower price for performance, and this Sunny model doesn’t include a console/monitor system. Instead, there is a tablet holder which will accommodate an iPad, so you can connect to your fitness app of choice and attach your own monitors (or listen to music, if you’d rather). The SF-B1805 has the usual safety and convenience features like floor levelers, emergency brake, water bottle holder and transportation wheels. Sunny’s SF-B1805 is a good midrange choice for those who don’t care about high-end features, but care greatly about having a stable, durable, magnetic resistance, belt driven bike of a high quality. Phoenix 98623 Revolution Cycle. Click the photo to check the Price on Amazon. The key to a good spinner is the workout, not the bells and whistles. That’s why the Phoenix 98623 makes our list; it doesn’t have some of the features you’ll find on higher-priced exercise bikes, but it’s a small, heavy and strong machine which will let you get your cardio and calorie-burning exercise with the same realistic feel as a road bike. The Revolution features a quiet chain-and-flywheel system, with the amount of resistance regulated by a braking system operated by a knob on the frame. One downside is that the system uses two brake pads, instead of just one as is common with most chain-style spin bikes, so it’s possible for the pads to get out of alignment and require adjustment or replacement. Two unusual positive twists, though, are that the 98623 has an “emergency brake” lever which stops the flywheel immediately if necessary, and it also allows you to pedal both backward and forward. This unit has an adjustable seat and handlebars, although the handlebars only move up and down and not horizontally, unlike fully-adjustable competitors. You’d probably expect that at this lower price point the bike would not have a monitor console, and you’d be right. Bells and whistles cost more – and this spinner costs less. For most people, that’s a tradeoff worth making. Sunny SF-B1001 Indoor Cycling Bike. Click the photo to check the Price on Amazon. 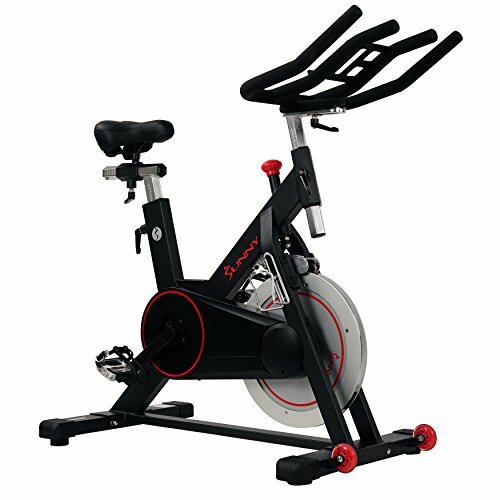 Extremely affordable and functional, the Sunny SF-B1001 is a great choice as an entry spin bike. This small unit (best suited to riders under 6-2) is quite study thanks to its steel skeleton, and provides a good range of resistance because of its chain drive system; as with most of these types of spinners, the resistance is controlled with an adjustable knob on the frame. The Sunny is a bit noisier than the other bikes on our list, but it’s not really loud enough to be intrusive as you’re riding. There aren’t as many comfort adjustments as you’ll find on more expensive competitors, with the handlebars only moving up and down, the pedals (which can, of course, be changed out for standard ones) only featuring toe straps, and the seat (which is not very comfortable, so you may want to replace or pad it) only adjustable over a relatively short range. There is also no console providing feedback on distance, speed or heart rate. The cost overrides any negatives you might find on this bike. If you’re looking for your first indoor exercise bike to be strong and provide a good workout – the Sunny is a very strong contender. The SB900 isn’t cheap, but it’s much less expensive than the models that top the Groom+Style rankings. And it’s definitely worth its price. This Sole Fitness model is a very quiet, magnetic resistance indoor exercise bike with a 40-pound flywheel. A heavy flywheel simulates the smoother ride and natural feel of riding an outdoor bicycle, although many riders (including those at G+S) have gravitated toward lighter flywheels like the 8-pounder on the Keiser M3 which spin faster because they lessen pressure on the knees and give muscles a better workout. Conventional wisdom still favors heavier flywheels like the 37-pounder on the Schwinn Fitness AC, though, and they are definitely a good choice for competitive bikers. The choice is up to you, of course. It’s not just the SB900’s flywheel that tips the scales with big numbers. Its frame is made from aluminum-shrouded steel, rather than all aluminum, which makes the bike quite heavy; you won’t be moving this baby around easily. However, the weight makes this Sole model an extremely durable spinner which will stand up to heavy use. You have the option of toe clips or SPD pedals, the ergonomically-designed handlebars and performance racing saddle are both adjustable, and transitions between the many levels of eddy-current tension (gradually adjusted with a turn-knob) are whisper-quiet. One downside for some users, though, is that there are no pre-set workout programs. The relatively small monitor shows the most important numbers like distance, speed, time, RPM, Kcal and pulse, and it’s compatible with a chest strap heart monitor (strap not included). It also doesn’t have speakers or WiFi/Bluetooth capability. 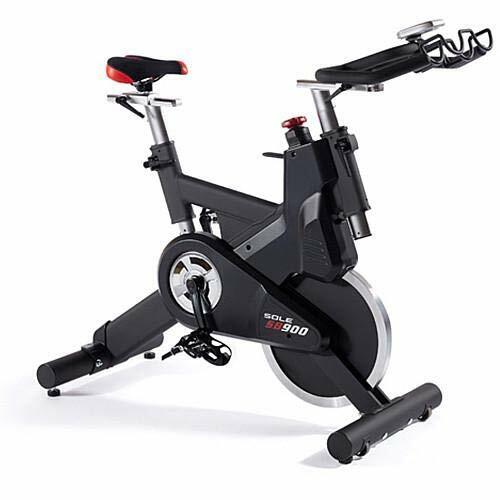 Sole Fitness’s SB900 is a less-expensive, well-built option for riders who want an indoor bike with a heavy flywheel, although its lack of pre-set programs may scare off those who want all of the bells and whistles. If the Keiser sounds like the ideal spin bike to you – except for its exceptionally-light flywheel – you’ll want to check out the Bodycraft SPR, which is quite similar in all other important respects. They both feature belt drive and eddy-current magnetic resistance which can be easily adjusted via lever, painted steel frames, fully-adjustable (vertical and horizontal) handlebars and seats, flywheels which are ideally situated behind the seat instead of in front of it, and basic consoles that show all important metrics but don’t have pre-set programs or Bluetooth connectivity. You’ll also need to buy a separate heart rate strap, too. The major differences (other than the flywheel) are small ones, such as the Keiser’s 24 levels of resistance compared to 16 resistance levels on the Bodycraft, and the fact that the SPR’s pedals only come with toe straps (SPD pedals can be added for an extra charge). This indoor bike provides an extremely smooth ride, the “infinite-adjustability” handlebars with multiple positions (including drop-down racing positions), and high-performance racing saddle makes the Bodycraft perfect for just about any body type or biking style. The construction is first-rate, with oversized industrial bearings and cold-forged steel cranks. Bodycraft also has 2 slightly lower-end models which you can compare via the links below. The Bodycraft SPR is an outstanding indoor bike, without consumer-style bells and whistles, that would fit perfectly in a gym as well as a home. It’s slightly less expensive than the Keiser (and looks a little cooler), but the real differentiation is its much larger flywheel. 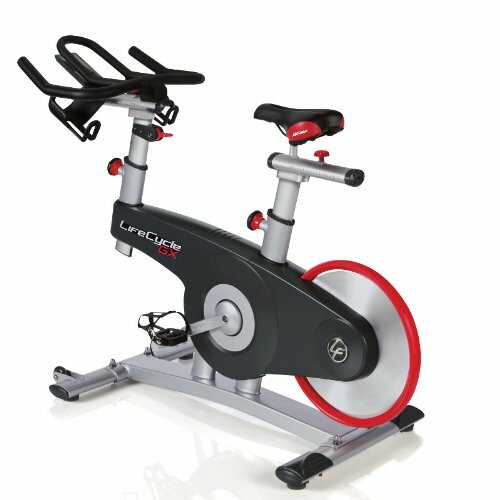 We replaced this Spinner L7 model with the better value Sunny Health and Fitness SF-B1805 bike. Ah, here it is – a true spin bike, made by the company (Madd Dogg Athletics) that popularized (and trademarked) the term Spinner. Over the last 25 years, their products have been sold under the names Madd Dogg, Spinner and Star Trak, so it’s hard to keep up at times. 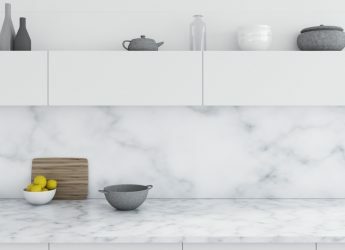 Their products, however, have always been extremely high-quality and durable, well-worth their price. This Spinner bike upholds the Madd Dogg tradition at a surprisingly reasonable price. One of our long-time favorites has been the now-discontinued Spinner NXT (which can still be found if you look hard enough, as can the old Sprint and Blade models – links below), but the company has come out with a new range of bikes (Lifestyle, Active, Performance and Commercial Series). 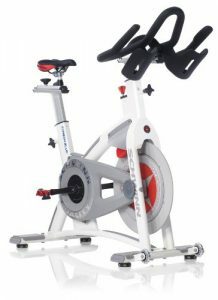 It offers the same Spinner high quality and attention to detail you’d see in one of their performance or commercial spin bikes, at much lower prices. The Spinner L7 is a perfect example. The L7 has a compact all-steel powder-coated frame, a terrific 36-pound perimeter-weighted flywheel and drive chain, umbrella-style resistance adjustment knob, and commercial-style leather brake pad. It also has all sorts of features you’d never expect to find on a sub-$1000 exercise bike: dual-sided SPD-compatible pedals, fore and aft incremental seat adjustments, and handlebars with micro-adjustment capability with a center section big enough to hold a large mobile device. This bike is lighter than most Spinners and easy to move, too, although it’s not built for riders taller than 6’ tall. It’s positioned at the high end of the company’s “beginner” line, but it’s more like the exercise bike you’d find in a gym. In short, the ride is smooth and comfortable, providing a true road bike feel – much more than you’d ever expect when looking at the price tag. The L7 fully earns the brand name Spinner, and it’s a winner. 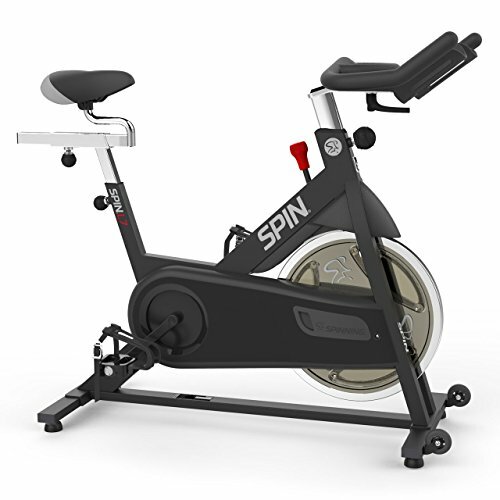 When looking for a home spin bike with a combination of high-quality, smooth ride and easy-to-take price, there’s no reason to look further than the Spinner L7 spin bike. Still haven’t exactly found what you are looking for, maybe a Recumbent Exercise Bike is more your style? 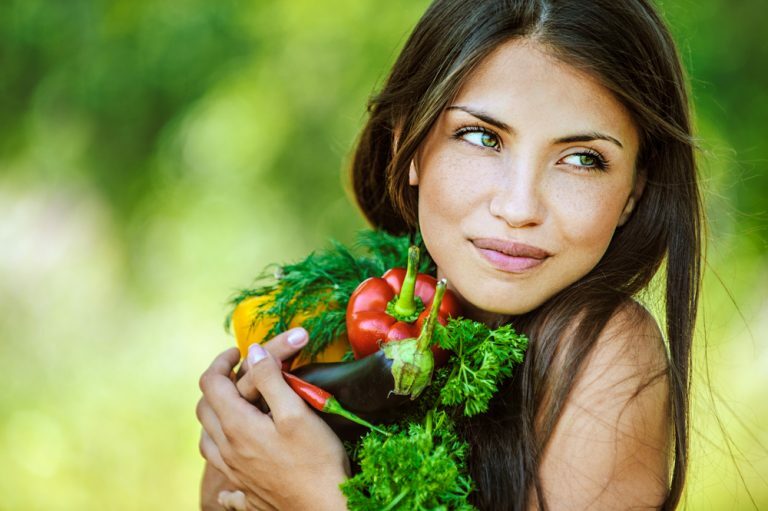 Also, don’t forget that even if your goal is just to increase your fitness and not just lose weight, an increase in the amount of fruit and vegetables in your diet is going to help you achieve your goals faster! 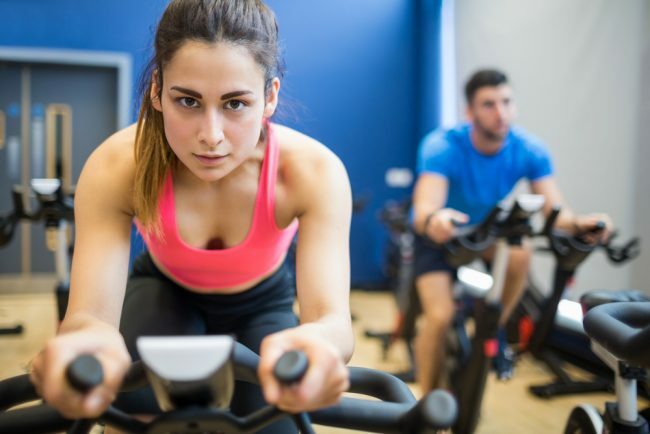 If you are looking for some options to add some excitement to your indoor cycling workouts then check out our article – Peloton Spin Bike Alternatives. I had a quick look on Amazon in the UK, but am not really too familiar with most of the models available. This one (linked below) seems to have magnetic resistance and be belt driven, and is reasonably priced – it is most likely built in China, and not sure what the support is like, but chances are it would be alright for your needs -> particularly seeing you are not that concerned about the “feel” of the bike etc. I also had a look for second hand Keiser bikes, and there do seem to some available in the UK for under your budget. So in summary I think you could just buy the most “affordable” and “convenient” magnetic bike with cable drive train available to you. If you find some good options feel free to send them over and I can add my 2 cents worth. – the easiest, where you use a peloton type workout app, where the instructors takes a spin class and talks about cadence/RPM and resistance (usually guestimated). For this you need a bike with a computer which supplies this information etc. – or participate in some group rides with apps like zwift etc. For this you need to send RPM and speed (to calculate a virtual power curve), or to be able to send power to the group ride app. This will typically require buying power pedals, or installing a wahoo cadence and speed sensor etc. 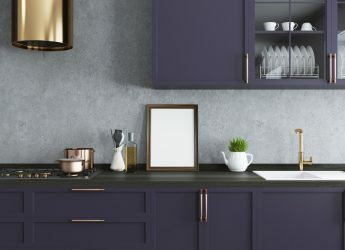 We have not tried that Sunny model so can only make some general comments extrapolating from our knowledge of their brand and having testing some of their other models. The Sunny SF-B1709 looks like an extremely good option for those athletes looking for a magnetic resistance, belt driven bike with a good bunch of options (computer, SPD toe clips and cage) at a very reasonable price. Yes, for the bike to “work” at all (to simulate the feel of a road bike) the drive-train must be driving the flywheel at a higher speed to generate the required level of inertia – how this feels and performs relative to the Keiser we are not sure not having tested the bike. In terms of comparing the bikes, the key differentiator is going to be quality and branding – think along the lines of why would someone pay $10,000 or more for a luxury watch when you can buy a cheap digital watch for $5. The key indicators are that the Sunny bikes are manufactured in China and Sunny offer a 3 year warranty on the frame and 180 days on parts. The Keiser bikes are manufactured in the U.S.A and they offer a 10 year warranty on the frame and 3 years on parts. If you don’t need “the best” and are just after function then the Sunny SF-B1709 looks like an awesome choice. 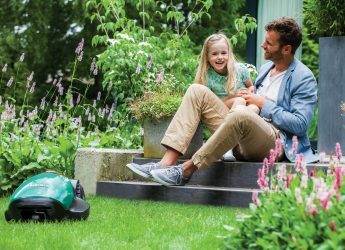 If you have cash to burn, want peace of mind in terms of build, full service support, and a bike that will last “a lifetime”, would be more motivated to ride on the Keiser, and like the kudos of having a premium product in your house then the Kesier might be the way to go. I was wondering what you thought of the Sunny B1709. It seems similar to the Keiser (7LB rear flywheel, magnetic resistance) but at a third of the price. Do you think they also use the higher speed? Thanks for the question and sorry to hear about the difficulties you are having. Yes, it is unfortunate that the Bodycraft computer cannot transmit its information to a 3rd party device. I guess this is not a huge problem if you want to just particuate in an online spin class but is a big problem if you want to participate in a group ride with your spin bike. We have not tried the GulGaz app but based on the article below, yes you need to transmit power to the app – speed and cadence will not work i.e. FulGaz cannot calculate the virtual power based on speed and cadence, like other group ride apps. if so this should work by being able to approximate the power curve with the information they receive from the cadence/rpm and speed sensors (i.e. you would need to replace your cadence sensor for a “cadence and speed sensor”)? Please email Zwift first to confirm this will work. It is difficult to advise on exactly how to mount the speed sensor but I am sure there is a clever/creative way to do this. 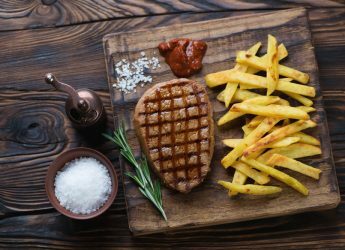 Are you confident enough to consider removing the cowling – not sure what that involves but it looks like there would be room there? Please read the SPR Build Manual for more information. Otherwise, if mounting the speed sensor is too difficult, then you can consider buying some power meter pedals. If you do buy a power meter pedal/s then you will need to align the pedals with the shoes and cleats that you have. It seems that most power meters use the 3 hole cleat system, which is more of a “road bike” system. If you bought the optional clip in pedals with the Bodycraft bike then you most likely bought the “Dual sided, top quality SPD pedals”. One side with the toe cage, other with clip-in? SPD is short for Shimano Pedaling Dynamics and is a 2 hole system. Which means your SPD shoes most likely have 2 holes? So you might need to replace your shoes if you cannot find a power meter that has the 2 hole cleats? Garmin Vector 3S Pedal-Based Power Meter -> https://geni.us/garmin2spowerpedal also have “Look Keo” cleats. Hope this helps – good luck. Thanks for the question and comment. Yes, we would always prefer a good quality belt designed bike over a chain driven bike where possible. In regard to the flywheel weights (I think you have read our article below on bike flywheel weight) the key point we were trying to get across is that a heavier flywheel is not necessarily better than a lighter flywheel – as a lot of people have assumed in the past. The Keiser flywheel is lighter but has a beautifully designed poly v drive-train (can transmit very high loads over very small pulleys) – which means the lighter flywheel spins faster for every rotation of the wheel creating the required inertia to simulate the road bike feel. Most/all other bikes have gone for a heavier flywheel with a simpler designed drive train, which spin at lower speeds to create the required inertia. At the $800 price range I would suggest that flywheel weight (you are not going to find a light flywheel [8lbs] like the Keiser at this price range because the engineering required to stabilise the drive-train is too expensive for this price point) would be less of a factor than bike setup and cycling technique. The flywheel weight options might be 10lbs difference either way, and if you get a chance then do try the different bikes, but I doubt you will notice much difference. 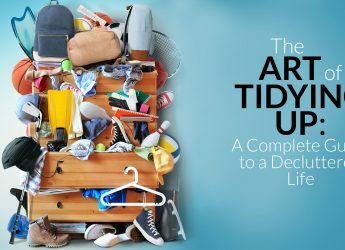 So take your time and focus on finding a bike that fits you best, set it up correctly, and spend a good amount of time focusing on your cycling/stroke technique and body position on the bike – these factors will serve you better over time. Hello, so after reading through some of your reviews, I recently just purchased a body craft SPR, along with the computer for the bike. I also bought a wahoo cadence sensor. 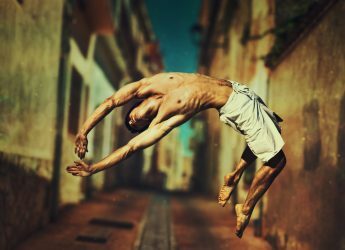 I want to try the fulgaz app on my Ipad. however when I pair my cadence sensor to the app, it tells me I need a power meter or speed. I am guessing that I should have bought the speed and cadence combo meter? Is that right? Will this fit somewhere close enough to the magnet on this bike? I guess I am struggling to get this set up. I need to have one sensor that will pair via bluetooth, but give me both speed and cadence is what I am thinking this means. Is this going to read resistance or speed? 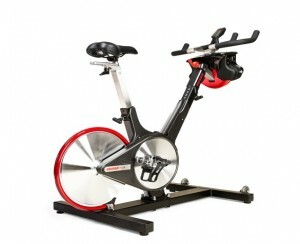 I know that this is what the call a Watt bike, but what options do I have to make this work? Can you help me get this set up? I really have appreciated your input and it lead me to the bodycraft bike, which I really like, however I am having a tough time getting the app working. Thanks so much and I will appreciate anything you can tell me. Thanks for the question and bringing this bike brand to our attention. We have not tried the EFITMENT IC033 (or any of the EFITMENT bikes) but it certainly ticks a lot of boxes in terms of magnetic resistance (although a very simplified implementation and design of this feature), belt drive and monitor. For the price bracket, you are probably trading down on quality, durability, customer support, design etc. But if you do not want the bike to last forever then it certainly looks like an interesting alternative? You are also correct regarding using an online spin class i.e. if the bike has a configured display with RPM’s, speed, resistance (or some version of it) then you do not need to attach an addition sensor like the Wahoo. We talk about this in the article listed below. I’m in the market for a home bike and looking for something that has a belt drive system with magnetic resistance but i am looking to spend under/around $500. I know it seems unrealistic at that price point but I came across the EFITMENT IC033 and wanted to know if you had any experience/opinions on this unit? Also, if a bike comes with an onboard display, which shows RPM’s, speed, etc.., would i still need the Wahoo sensor to join any “online” spin class? Thanks for the question. The NXT black belt and NXT bikes are models manufactured by Madd Dogg Athletics – see our Number 4 write up. These are great quality bikes and as long as they have been looked after we would not have a problem buying a second hand or refurbished model (of course without seeing the bikes we cannot guarantee anything), and the prices you have mentioned sound very attractive. Maybe try and get some sort of free service or warranty as well? Neither bike has magnetic resistance (you would generally need to pay more for that) but the NXT Black Belt is belt driven and is the model we would recommend if you can afford it. The NXT is chain driven, and chain driven bikes are noisier and will require more servicing (which requires some skill) – and as this is a second-hand bike we would consider this a small risk. As someone looking to purchase a spin bike there are a lot of options out there. Initially, we were looking at a peloton but have decided that we can simply buy a more affordable bike to start and use their app. That said, there are two bikes near us from dealers that we’re interested in. 1) NXT black belt – couldn’t tell you anything about it except that it is used and they want $699, and 2) a NXT – also used, but $399. Would you feel confident enough purchasing one of these used? 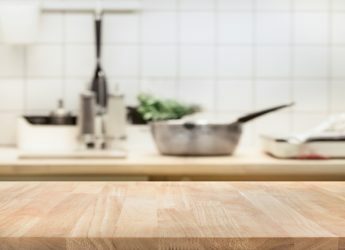 Anything I should look at prior to purchase? I appreciate your input. The good news is that the Star Trac bikes are still available under the updated brand Spinner (previously Madd Dogg athletics and then Star Trac). Spinner has a wide range of high quality and durable bikes available (Lifestyle, Active, Performance and Commercial Series bikes) which you can read more about in our article above. We focused our review on the Spinner L7 Spin Lifestyle Series Indoor Cycling Bike, as it is a brilliant bike for the price and functionality. Hi! I used to have the star trac spinning bike and for me was the perfect ride. Im looking to a comeback in Triathlon and for me indoor training is the most convenient choice. Im looking for a bike as good as my star trac or at least similar because I cannot find the same one, apparently they are discontinued. Which one do you recommend me? No one in the our team has tested the Nordictrack s22i. As you probably know it is trying to compete in the same category as the Peloton bike. 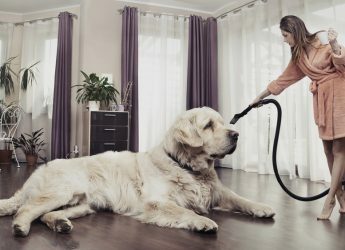 Personally, if I was looking for this type of indoor bike trainer I would spend a bit more and go for the Peloton – the key reason being quality and support. You can find a great comparison of the 2 bikes specifications via the link below. 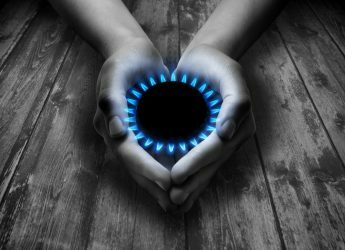 You can also read the article below to see what other options you can consider. Sorry to hear about the shoulder issues – I personally know how annoying that can be. 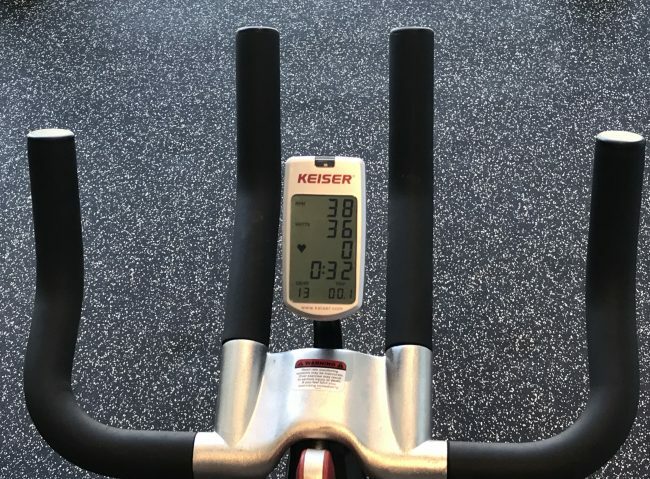 If you are happy to pay for a quality indoor spin bike (good news is they hold their value really well) then I would focus on the Keiser M3i or the Schwinn. They are both brilliant bikes, high quality etc. As we talk about in this article and the extended article linked below the key difference between the 2 bikes is the flywheel weight – as an experienced cyclist, you will find the Keiser light flywheel “easy” to get used to as you already have great cycling technique. 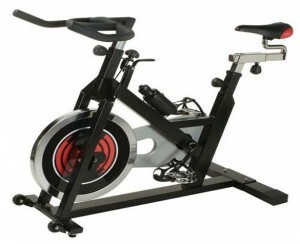 The Schwinn will feel more like a typical spin bike (more aggressive pulling of the legs through the pedal stroke). If you have a chance to try both that would be ideal. The other key difference is the handlebars – once again testing the bikes is the best option with your shoulder. But you can get a feel for the minimalist handlebars on the Keiser vs the Schwinn from the pics on this page. Can you tell me your thoughts on the Nordictrack s22i? Thank you.